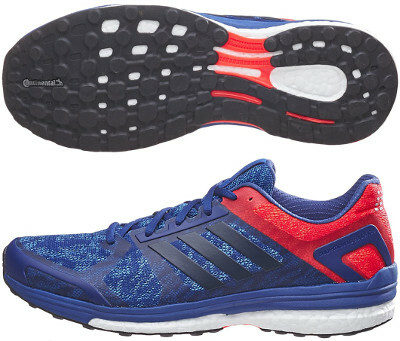 Adidas Supernova Sequence Boost 9 are stability cushioned running shoes. The renovated Adidas Supernova Sequence Boost 9 is the third Sequence edition featuring Boost™ midsole which becomes the current de facto standard for the german brand making buzzword to get removed from official naming. The Supernova Sequence 9 it is a great choice for those runners looking for moderate pronation support and great cushioning for either daily training or racing long distances up to marathon. Compared to its predecessor Supernova Sequence Boost 8, upper has been simplified replacing some plastic from external side with fused elements over breathable mesh for more comfort. There is a gender specific system for custom fit so it adapts better to different properties (size, weight) improving running experience. Rest of Supernova Sequence Boost 9 basically keeps what it was working fine in previous editions: midfoot integrity provided by TORSION® system for smoother transition and internal full length frame (StableFrame) for reliable stability, a concept developed with the great performance from the good old Adistar saga in mind. Outsole adapts "Stretch Web" concept from bigger sibling Ultra Boost ST with Continental® rubber for more secure toe off and better grip even on wet surfaces.